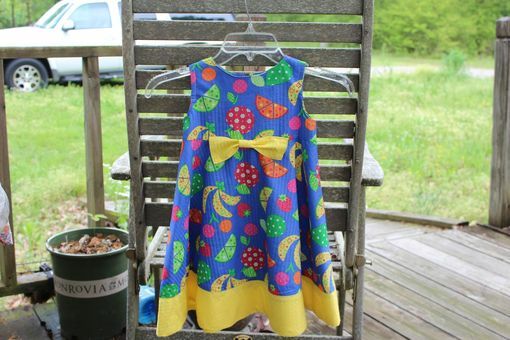 This is a size 4 dress made with what is called Tuiti Fruiti fabric. It reminds me of seersucker fabric from my childhood. It is so light and cool. I get a lot of joy in making the little girls dresses because I don't have any little girls to sew for. I do enjoy making things for my boys; but I love making the cute little girls things. This little dress is so bright and happy with a sunshine bow to accent the empire waistline, and matching border on tail of dress. It has a zipper closure in back. Prices vary according to size.